Rathcroghan is a huge complex of archaeological sites centered around the main mound here at Rath Cruachan, which is believed to be the royal seat of Connacht. Although there is no great historical or physical evidence to show this, Rathcroghan is at the very heart of Celtic Mythology. This was the seat of Queen Maeve, the Celtic warrior Queen. 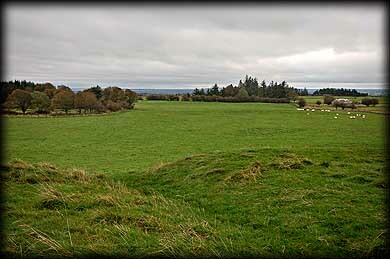 Rath na tDarbh is where the battle of the bulls took place in the legendary tale Táin Bó Cúailnge. 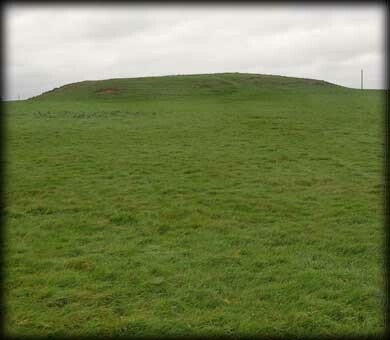 Oweynagat - The Cave of the Cats - is the entrance to the Otherworld, Relig na Ri the burial place of the Kings, Daithi's Mound, said to be the burial place of the last pagan High King of Ireland, Rath Mor, Rath Beagh, all these sites and many more make up this vast Celtic Royal Site. 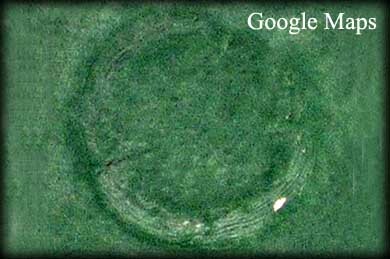 It is impossible to try and depict in pictures the enormity of this fabulous complex, these mounds are so huge they do not come across well in images. The best way to see these monuments is on foot - this way you get a real feel for the size and can also feel a sense of history as you walk through the fields. Rath Cruachan is 90 metres across at the base. On the top is a small barrow 6 metres wide. There also appears to be an entrance at the northern side marked by two standing stones. These are known as Misgaun Medb and Milleen Medb. I would recommend visiting the Cruchan Alí visitor centre in Tulsk before visiting the monuments or for a personnel tour use Mike Croghan from Rathcroghan Tours to act as your tour guide. Situated: From Tulsk head north on the N5. Rath Cruachan is situated about 2 k north of here in Toberrory on the west side of the road. There is a Car-Park. Discovery Map 33: M 7996 8369. Last visit Sept 2011.